Do you like listen to internet radio? How can you find your interesting radio around the world? 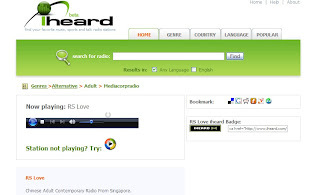 Iheard is a search engine for search internet radio, that provides an easy way to use search interface and directory with thousands of stations organized by genre, country and language. It supports streaming formats that depends on the station that includes RealPlayer, Windows Media Player, Winamp and iTunes. You can listen them with Iheard, or click a link go to station site. I check Chinese radio by language, unfortunately it just has 8 stations that includes mainland China, Taiwan, UK, Australia, and Singapore . I knew many internet radios online that speak Chinese, but Iheard just collects a few. If you like listen to radio by English that be a big choice.